I’ve followed the invaluable conservation endeavours of Animal Works since its beginning and I have to say what a wonderful opportunity to be able to contribute to the conversation and education regarding the protection of our magical natural world through blogging on this website. My name is Kylie Butler and I am a PhD student with the University of Newcastle, Australia researching what I consider to be one of the most globally important issues – human-elephant conflict. To briefly introduce myself, I have previously worked as an intern and Master of Environment research student with Save the Elephants in Kenya, and on an elephant ‘voluntourism’ project with Global Vision International in Thailand. Everything about elephants fascinates me – from their intricate individual behaviours, their family and social structures, their cultural and religious value and how this helps or hinders their conservation and welfare, and their tricky relationship with human beings. This co-existence with humans forms the basis of my PhD study, and I imagine will be the focus of the vast majority of my blogs, as it is this topic that is consuming my life right now. At present, I am sitting in the open-walled research/field house of the Sri Lanka Wildlife Conservation Society (SLWCS), competing with a myriad of insects that are attacking my computer screen, and planning just how I can contribute to human-elephant conflict mitigation here in Sri Lanka, where the unfortunately not uncommon scenario of rising human populations and reduced elephant habitat, is contributing to escalating levels of human-elephant conflict. 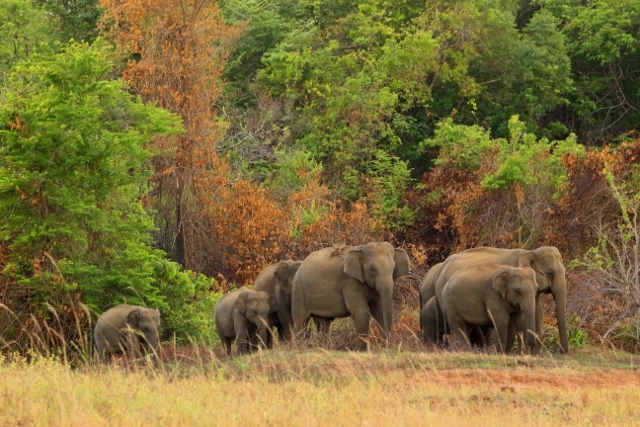 I am working under the supervision of Dr. Lucy King (Save the Elephants) and in collaboration with SLWCS to investigate the behaviour and social dynamics of elephants in a heavily crop-raided area of Central Sri Lanka. What I will do over the next two years, is to examine characteristics of crop-raiding elephants, their personality, their relatedness to one another and to identify how these factors may influence an elephants propensity to crop-raid. Simultaneously, I will be introducing beehive fencing as an elephant crop-raiding deterrent. Beehive fencing was designed by my supervisor Dr. King and is showing tremendous success in Africa, where farmers are benefiting considerably from reduced crop-raiding events and an alternative income source through honey sales. A beehive fence is, put quite simply, a series of beehives hung from posts and surrounding an area to be protected from elephants. The beehives are connected by wire, and should an elephant attempt to move between the hives to access the crops inside, it will hit the wire causing the beehives to swing, and the bees to swarm out and sting the elephants. Understandably, elephants do not appreciate bee stings and avoid the fences! This concept is new to Asia and working with a different species of elephant and a different species of bees could of course, produce different results. This is why it is so important to test this idea in Asia and evaluate the potential here. Like so many other human-elephant conflict areas, my research site in Dewagiriya Village, Sri Lanka is a low socio-economic community where farmers rely on crops to support themselves and their families. This village is in close proximity to Wasgamuwa National Park so it is possible elephants are leaving park boundaries to crop raid. However, many elephant also reside primarily outside of National Park boundaries here. Elephants are tempted by the tasty treats of paddy fields, maize, fruit trees and vegetables, even breaking into houses to access crops stored inside. One farmer even told me of an elephant breaking down their kitchen wall and taking his salt. Here, I see both the devastation an elephant can cause to the farmer, and the devastation the farmer can cause to the elephants. Many elephants are suffering from bullet wounds and are obviously aggressive and nervous around people. I am currently setting up a trial beehive fencing site of 8 fenced farms, looking at protecting people’s homes and home gardens to evaluate the initial potential of this low-cost, low-maintenance technique to help keep both elephants and people safe. Stay tuned over the coming months, as I discuss further the issues facing Dewagiriya village, which I believe are representative of many human-elephant conflict areas, how the beehive fences are progressing, and other human-elephant conflict related issues. *A big thank you to Save the Elephants and the Sri Lankan Wildlife Conservation Society for their collaboration on this project, and to the Rufford Small Grants for Nature Foundation, Chester Zoo, Elephant Action League and Phoenix Zoo for their financial assistance.